“I always try to be better than the other middle on the other side,” said Kennedy. “I just wanna go out there and destroy them.” Kennedy’s competitive side shines when she plays, and she says the whole team is working on their mentality. After making it to the elite eight last season, and finishing seventh in the country, the Rangers, in Kennedy’s words, have a target on their backs. Because of their reputation, teams are coming at them playing their hardest. Fighting through that has defined their season thus far. They’re currently on a four game win streak with a record of 8-5, so it hasn’t held them back too much, but the team puts pressure on themselves to outplay every team they see. Changing their expectation of how tough games are going to be is something they’re working on according to Kennedy. “We go in with such confidence in our playing and then they come out and just play way better than we expected and we have to expect that,” she said. The team’s goal this season is to return to the elite eight, but, this time, they want to bring home the National Championship. They’re still a young team, only losing one senior last year and sporting just four this year, and figuring out leadership roles is one step Kennedy thinks they’ll have to take before they bring home the title. Kennedy knows something about bringing it home because that’s what Regis did with her. 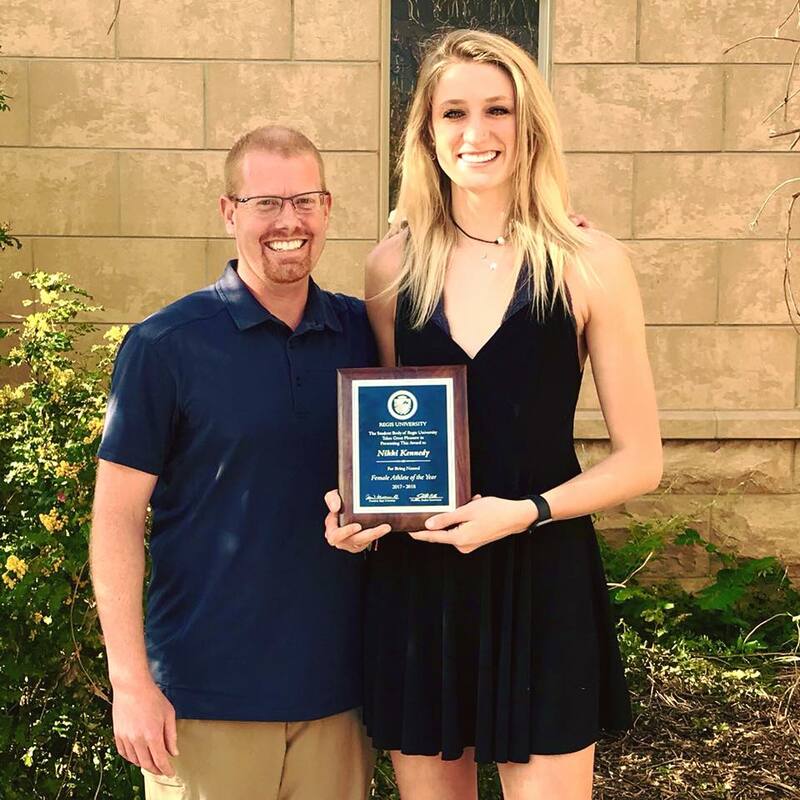 She originally redshirted and played a season at University of Denver (DU), but, due to complications with eligibility out of her control, she ended up being released before the fall of 2016. She took that semester off to consider her future, and came to Regis in the spring of 2017 with three years of eligibility to give the Rangers. “I honestly didn’t know what I wanted to do,” Kennedy said. “I kinda wanted to keep playing in college and I also was like I don’t know what I wanna do because that...just threw a huge loop in my life.” When Regis reached out, Kennedy was excited because of her familial ties to the university. Her brother is on the baseball team, her dad got his MBA here, her aunt and grandpa used to work her, and her uncle still works here. Her grandma has been working in financial aid for 30 years and is still going. For Kennedy, Regis was a place where continuing her collegiate career would mean more than just getting her degree. When the team started making a name for themselves on campus last year, Kennedy’s grandpa told her he’d never seen the school come together like they did for the regional game that sent the Rangers to the elite eight. “I always watch the video of the last point on that [game] when students stormed the court,” Kennedy said. “It was just a great atmosphere. It’s really fun when students do come.” This season should be just as good and the team is hoping students will keep showing up and showing their support. When Kennedy isn’t playing volleyball or working on her Communication major, she likes to chase the sun and the tunes. She’ll go to Boulder to see her sister, and they’ll hike and hammock. She also loves seeing concerts, especially at Red Rocks. Her latest concert was J Cole. She loved his performance but regrets that it was at the Pepsi Center because it’s too big for a good concert.